TrueView for shopping is a new feature from Google which allows advertisers to promote their products in a fresh and exciting way. TrueView for shopping allows for an easier connection between seeing products advertised in a video and clicking through to actually buying these products seen in the video. This feature enables advertisers to showcase product details and images within a video advert. Customers can easily click on the details and images and are then taken straight through to the product page, making shopping much quicker and easier. If there is a product you wish to really push as an advertiser, then TrueView for shopping provides a great solution. Simply create a video ad with the product and create a click-through link for customers to click on. As soon as the customer is taken through, they land on the product page and voila, they can quickly buy the product from you! TrueView for shopping is available for in-stream video adverts on YouTube. A massive 50% of views on YouTube come from mobile devices. This has in part inspired Google to ensure TrueView for shopping works seamlessly on mobile phones as well as desktops and tablets. 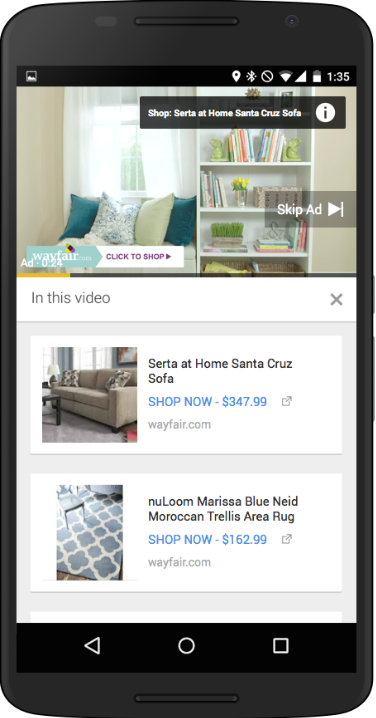 This is the first time Google has integrated the Google Merchant Center with video adverts. This means that advertisers only need to connect their video campaign with a Merchant Center feed. Advertisers can dynamically advertise different products to their in-stream videos. Advertisers can even customise their adverts for each user based on their geographic and demographic locations. Early tests of TrueView for shopping have shown really positive results for advertisers in terms of building interest and sales. Wayfair, an online home-goods retailer, reported their revenue per impression increased by three times as much as what it was before using TrueView for shopping. Additionally, Sephora, a beauty retailer, had an 80% increase in consideration and a 54% increase in ad recall. More and more people will be using TrueView for shopping in the future. To keep up to speed with the evolving advertising world, get in touch with Keel Over Marketing today to enquire about account management. See how TrueView for shopping can help you! Previous PostPrevious What is PPC?